Advanced NLC display on July 10th 2011 captured over the Atlantic Ocean in proximity to Dunluce Castle on the Co. Antrim coast. This borderline type 5 brightness display glowed in the sky in spectacular fashion while illuminating the sea below with it's eerie blue light. 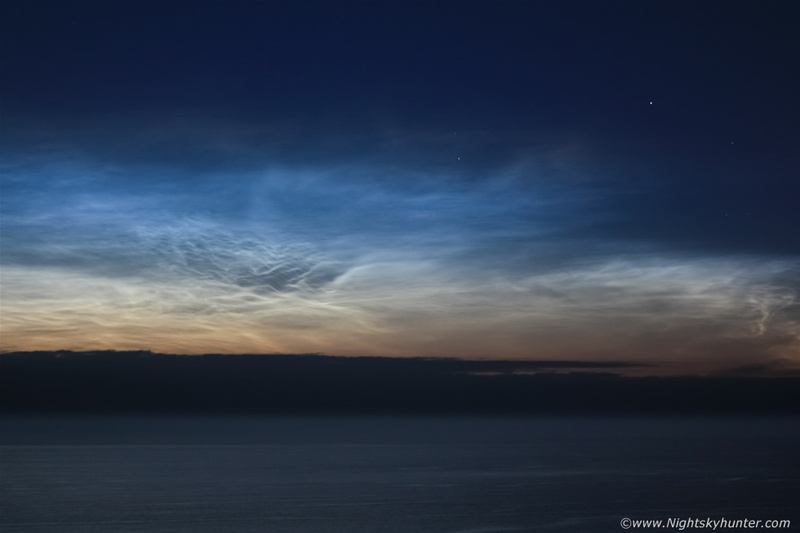 This night there was a vast exhibit of NLC structure on show featuring Veil, small, medium and large scale whirls complimented by complex waves , knots and lacunous holes. Capella and 'The Kids' are the stars visible in the clear sector on the right hand side. * All images are available for sale in the form of photo prints, canvas or digital files for licensing, if you are interested in a purchase simply drop me an email.